By John Smith | October 6, 2015. Dylan aged 10 and Oliver Woods aged 13 from Wicklow at the launch of Saint Patrick’s Cathedral’s new discovery space. Pic: Marc O’Sullivan. Q1. How did the idea of the whole Discovery Space come about? A. I suppose the South Transept was always a part of the cathedral that there was very little in; It was a very dark corner of the building that had little or nothing in it to make people stop. It kind of ended up being a dumping ground for anything and everything, so I suppose that attitude of the cathedral was to constantly look at ways of making it a more visitor friendly space anyway. So this area was ripe for development and I suppose the idea behind it is to then kind of create as many opportunities of engagement as possible for the visitors, so instead of just people having a passive-experience where they walk around, they actually have physical activity to interact with. Q2. And what different things are in the Discovery Space? A. 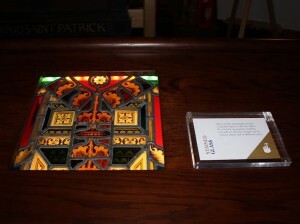 There are a few different elements; we have the touch-screen table, obviously, which covers lots of different things (stain glass windows, monuments, hidden parts of the cathedral that you wouldn’t necessarily see otherwise), then you have the iPads, which have the cathedral app on them, which again is another layer of information. That would be the more technological side of things. 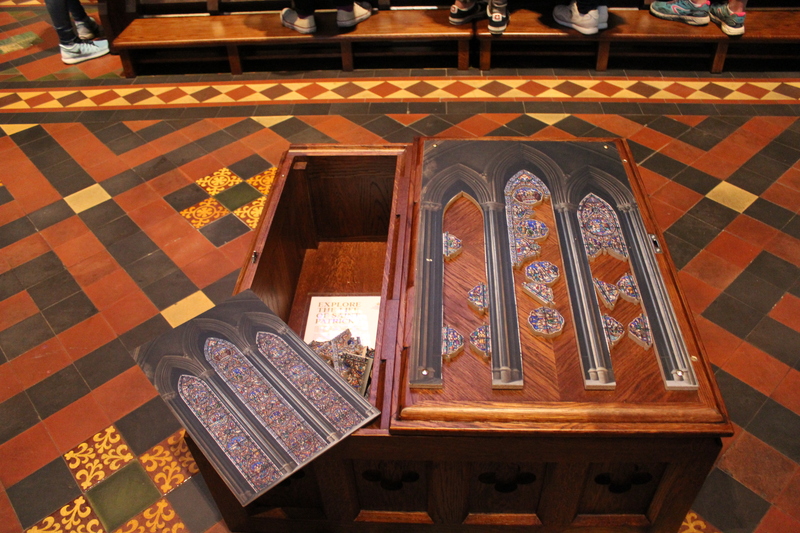 Then on a more hands-on experience, you have; brass-rubbings, you have a jigsaw of one of the stain-glass windows, you have a building blocks model of the cathedral and then we have a handling unit as well, with various different fabrics from around the cathedral. Q3. And the brass-rubbings, what or who are they? A. They’re people. Traditionally brasses would have been added to the cathedral, kind of around the 16th or 17th century, and as commemorative brasses for different families. Taking a rubbing became something that was done. It’s kind of a past-time for a lot of people but taking continuous copies of an original brass-rubbing will damage it, so what we have are replica brasses of people, not necessarily connected to here, but they’re kind of medieval figures in general. Q4. Are they also in the cathedral? A. We have some brasses, not of the ones that you can take a copy of. There are four 16th century brasses in the cathedral. Q5. In relation to the Discovery Space, where are they located? A. They’re in the South Choir Aisle, right beside the Discovery Space, and there’s a map / interpretation panel on the brass-rubbings unit showing where they are. Q6. You mentioned the app, is it the same content on the app in the cathedral that you can get on your phone? A. Basically yeah. It’s the same app. Now we have had to curtail some of the content on the ones in the cathedral because it’s external content to the one on the app so for keeping it ‘on track’, we have had to do that. But you’re not missing out on anything. So it is a free-downloadable app. Q7. And what impact has the Discovery Space had so far on the cathedral? A. Very definitely you can see that it has increased the amount of time people spend, particularly in that part of the cathedral, and overall in the cathedral in general as well. There’s more things for people to do. We reckon there was about 600 brass-rubbings being taken per-day, in the height of the summer, which was kind of maybe one in every three visitors. So, even just that alone. People are engaging with what’s there, instead of coming in, not perhaps taking a tour, walking around for 15 minutes, and leaving again. People are spending 10 / 15 minutes in the South Transept. It is a more memorable experience, if they’ve come and actually partaken in something, then that’s something they can take away with them. They can take their brass-rubbing away with them, which most people were doing. Again, you’ve interacted with various different elements throughout the building, and that is constantly creating a more memorable experience, because you’re engaging with as many senses as possible, rather than just walking around and looking at stuff. Q8. Has it raised awareness? A. I think the people coming are getting a better experience, rather than necessarily saying it has increased the number of people. But the number of people has been increasing all year as well, so it’s coming together. Q9. It’s a one-time entry fee? A. Yes. €6 gets you in the door and then everything after that is free. Q10. Do you hold workshops etc in the space for schools? A. We have a free education offer, for any school within the island of Ireland. The kind of structure for most of them would be they come in, they get a guided tour of the building, and it’s obviously a specific kind of tour for the age range. And then we have a couple of different workshops that we’d offer after that. So we have a medieval workshop, which would use the brass-rubbings for instance. There’s calligraphy in that, and we also have some building blocks that you build an arch out of, so it’s building team-work there as well. They’re different blocks to what would be there otherwise. We have a stained-glass workshop and a music workshop also, but what we’ve noticed now is that schools, can interact with the space after their workshop. So there’s now more to offer schools. Q11. What is the thing that would be highest in demand in the DS? A. The Brass-rubbings, absolutely. And all along we had reckoned it would be the main thing. The first day we put them out people were queuing up to do it. And as I said, there’s about 600 done a day, so keeping the paper stocked up is difficult. It’s the one piece you can take away with you, so you do have a physical memento. It’s loved across the board, for all ages. By far the most-popular of the lot. Q12. The DS is made out of the old pews correct? A. Yes. 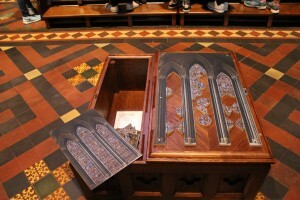 Those pews would have been set-up in the South-Transept. So to do anything with that space they would have had to be removed, but because they’re dating from the 1860s, the planning office weren’t prepared to allow us to just get rid of them. So, the planning permission was given on the basis that we find a way to recycle those. And it means that, yes it’s a new space within the building, but it doesn’t stand-out as being new. It’s just modernising what was already there. Obviously some new elements had to be added, but the big units were all there. So we kept the original oak carvings that were there. Q13. So what is next? A. 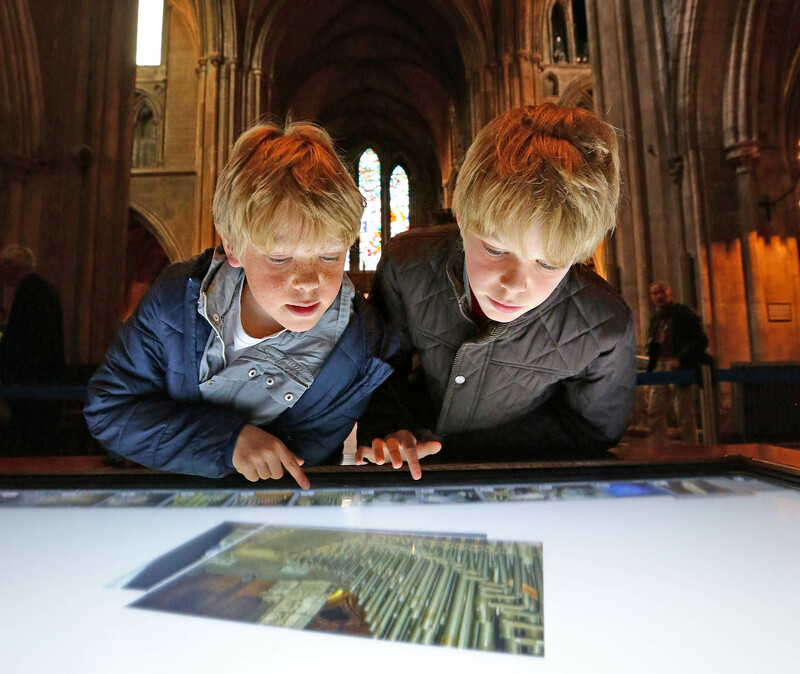 Overall, with the cathedral, the idea always is to find new ways at improving the visitor experience. So we’re kind of looking at taking on a more large-scale project and looking at the cathedral as a whole, and seeing how its interpretation across the board can be improved. Because right now, we have different eras at the moment that are not necessarily consistent across the board, so we’re in the process at looking at that to make it more cohesive of a story for the visitor perspective. We’re also looking at updating our website, because that’s quite dated now. There is potential for talks in the DS as we can close off the space too. Is Zverev on the road to world dominance?